For the best adventures, use the best map. Azores Tour & Trail Super-Durable Map is the most detailed, accurate, toughest, large scale map of these 9 islands that you can buy. Super-Durable Maps now come with a 2 year adventurous use wear and tear guarantee, see Discovery Walking Guides website for details. 1:60,000 scale for each island, Sao Miguel at 70,000 scale, produces a double sided map sheet of 960mm by 694mm; big enough to show masses of detail but compact enough to use in the car or on the trail. Faial, Pico, Santa Maria and Sao Jorge are on the facing sheet of the map with Corvo, Flores, Graciosa, Sao Miguel and Terceira are on the reverse side. Our special concertina map fold means your map is easy to unfold, and more importantly easy to refold back to its pocket size. You get the most detailed map of the Azores islands that is produced including our 'Tour & Trail' level of detail ranging from major roads to secondary roads to minor roads to streets and narrow country roads, plus dirt roads and walking trails. We have a new method of highlighting the official and published walking trails. This makes it easier to identify the walking trails on the map and easier to find them on the ground. Altitude background colouring is designed to clearly show the altitude range when traveling across the islands by car or on foot. 100 metre and 20 metre contours are clearly shown on the map along with a large number of individual height points. Tour & Trail attention to detail is legendary as is our useful symbol range including miradors, picnic areas, petrol stations, bar/restaurants and parking areas where you can pull off the road safely. For adventurers on foot Tour & Trail Maps are researched and designed by hikers for use by hikers. Our comprehensive gps ground surveys produce the best road mapping available but the value of this on the ground research becomes even more important when you leave the tarmac. Super-Durable editions are printed with special UV cured inks on a 100 micron plastic substrate using the only UK press equipped with this latest technology. The result of using this new technology is a Super-Durable Map that feels like silk but will stand up to the roughest treatment of outdoor adventuring and yet fold up like new at the end of your adventure. Quite simply Azores Tour & Trail Super-Durable Map is the most detailed, accurate, toughest, map of the Azores islands that you can buy. 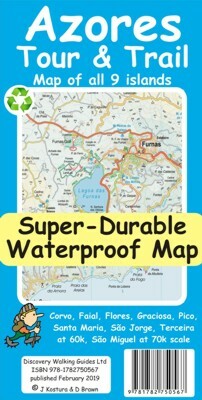 Super-Durable maps are 100% recyclable. Digital Custom Map editions of the Azores Tour & Trail Map is available as a free zip file download from the Discovery Walking Guides website for use on Garmin gps units and in Garmin Basecamp and Google Earth software.